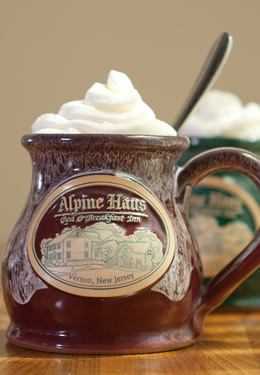 Whether you choose to stay in a guest room or a Carriage House suite, the Alpine Haus Bed and Breakfast Inn in Vernon, NJ is pleased to provide guests with personalized service and beautiful accommodations and that you won’t soon forget. Our living room provides a place to relax while reading, conversing with other guests, scanning restaurant menus or brochures of area attractions. 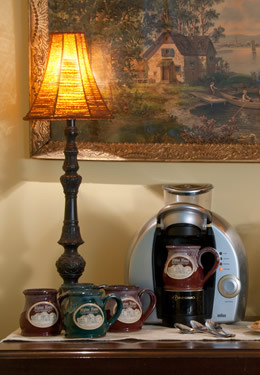 Homemade cookies and the coffee/espresso machine are always available to our guests. Selections of games are available to play here or in the privacy of your room. Our ground-level patio offers a table and chairs, wicker chairs, and a rocker, and is accessible to our ground-floor rooms. 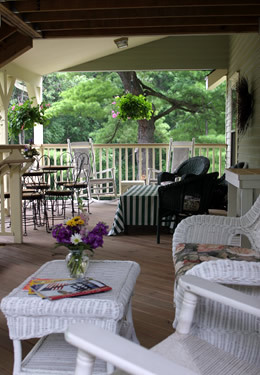 Our second-floor covered porch with wicker furniture and rocking chairs are perfect places to relax, read a book or have a glass of wine and watch the sunset. Also, enjoy using your laptop, smart phones or tablets throughout the inn with our complimentary wireless Internet service. Let us assist you in planning your visit. We have extensive knowledge of all local attractions, activities and restaurants. We can customize an itinerary to your liking. See Area Attractions. We also provide packages for massages, skiing/snowboarding, and waterpark visits. See Specials and Packages. Special Purchases to Make Your Stay Extra Special!! Special items or services can be arranged in advance of your arrival. Items such as, in-room chocolates, flowers, cheese & crackers, massage or even a lunch-to-go for two. This is especially great for those guests who enjoy hiking several hours or day hikes on the Appalachian Trail. These items must be reserved at least 48 hours in advance. See our Specials and Packages page. Give the gift of relaxation and romance! No matter what the occasion Alpine Haus Bed and Breakfast Inn gift certificates are the perfect choice for your friends, loved ones, or whoever needs that special pick-me-up. 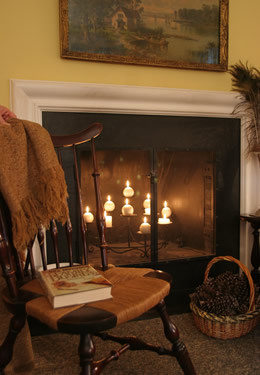 Gift certificates can be purchased for any amount or for a specific room or suite. We will mail or email the certificate to either you or the recipient for ease-of-giving.